For years now many CEOs and key influencers have been saying the print issue will soon be dead. Now there is fresh concern with the news that the Independent will cease printing and go digital next month. 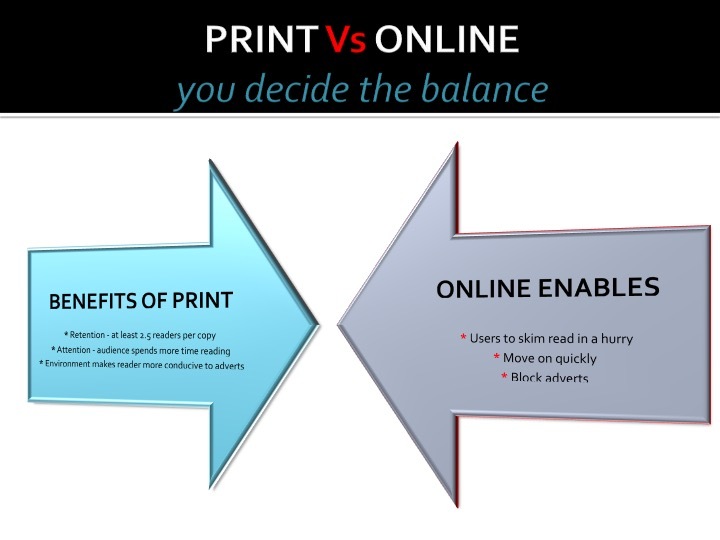 So should publishers rethink their print contingent? No – and here’s 4 reasons why not. Advertisers like print. It provides them with an opportunity to target a high circulation – without their ads being blocked. A stronger advertising sales strategy to boost cashflow would be better than losing a print edition. Magazines as part of a package. Publishers need to think in terms of a 3600 strategy when it comes to content because digital and online should enhance print – not steer the audience away from it. A demand for print. While many of us consume our news online the majority still love a print edition. Why? Because no matter what – the loss of an Internet connection, a phone/tablet running out of battery or your laptop crashing – a print edition is always there, waiting to be read. And who doesn’t still savor the look and feel of an articulately designed publication? Added value. It’s not just advertisers who demand more for their money. Readers want more too. But the key here is finding out what they do want and how they are likely to consume that content. Some publishers make the mistake of overload online instead of providing intelligent, thoughtful content that has a purpose. ← What can we learn from 2015 and how will those lessons shape 2016?